Despite Denials Justice Amir Hani Muslim Seems to Have Been Compromised. A Fair Judgement in Panama Leaks May Not Be Possible. This is a typical article published by CFR an Indian and Zionist top heavy pro-India Think Tank in Washington. Subconscious bias, Islamophobic bigotry, and pro-India tilt is self-evident in this subtle propaganda. India’s external intelligence agency, the Research and Analysis Wing (RAW), has long faced allegations of meddling in its neighbors’ affairs. It has shifted its focus to India’s other traditional rival, Pakistan. RAW and Pakistan’s spy agency ISI. Founded in 1968, primarily to counter China’s influence, over time Inter-Services Intelligence (ISI),have been engaged in covert operations against one other for over three decades. The ongoing dispute in Kashmir continues to fuel these clashes, but experts say Afghanistan may be emerging as the new battleground. Islamabad sees India’s growingdiplomatic initiatives in Afghanistan as a cover for RAW agents working to destabilize Pakistan. It accuses RAW of training and arming separatists in Pakistan’s Balochistan Province along the Afghan border. RAW denies these charges, and in turn, accuses the ISI of the July 2008 bombing of the Indian embassy in Kabul. India’s External Intelligence: Secrets of Research and Analysis Wing. Founded in 1968, primarily to counter China’s influence, the agency has shifted its focus over time to India’s other traditional rival, Pakistan. Not much is known regarding the structure of RAW, say experts. The organization started with 250 people and about $400,000. It has since expanded to several thousand personnel, but its staffing and budget remain secret. However, an estimate by the U.S.-based Federation of American Scientists suggests that in 2000, RAW had about eight to ten thousand agents and a budget that experts place at$145 million. Unlike the United States’ Central Intelligence Agency (CIA) or Britain’s MI6, RAW reports directly to the prime minister instead of the Ministry of Defense. The chief of RAW is designated secretary (research) in the Cabinet Secretariat, which is part of the prime minister’s office. Some officers of RAW are members of a specialized service, the Research, and Analysis Service, but several officers also serve on deputation from other services such as the Indian Police Service. Monitoring the political and military developments in adjoining countries, which have a direct bearing on India’s national security and in the formulation of its foreign policy. Seeking the control and limitation of the supply of military hardware to Pakistan, mostly from European countries, the United States, and China. Experts disagree on the amount of influence RAW asserts on India’s foreign policy.Sumit Ganguly, a professor of political science at Indiana University, says the agency has no influence on foreign policy. However, Dipankar Banerjee, a retired army official and founding director of the Institute of Peace and Conflict Studies, a New Delhi-based think tank, says the head of RAW has direct access to the head of state, to whom he provides input and analysis. From the early days, RAW had a secret liaison relationship with the Mossad, Israel’s external intelligence agency. The main purpose was to benefit from Israel’s knowledge of West Asia and North Africa, and to learn from its counterterrorism techniques, say experts. RAW played a significant role in the formation of Bangladesh along with the Indian army and other Indian security and intelligence agencies. Besides providing intelligence to policymakers and the army, RAW trained and armed Mukti Bahini, a group of East Pakistanis fighting for the separate state of Bangladesh. Analysts say that RAW also facilitated the northeastern state of Sikkim’s accession to India in 1975, and provided military assistance to groups hostile to the pro-China regime in Myanmar, such as the Kachin Independence Army. But it was the support for the Tamil separatist group,Liberation Tigers of Tamil Eelam (LTTE)in Sri Lanka, that brought RAW much criticism from human rights organizations. RAW helped train and arm the LTTE in the 1970s, but after the group’s terrorist activities grew in the 1980s-including its alliances with separatist groups in the southern Indian state of Tamil Nadu-RAW withdrew this support. In 1987, New Delhi made a pact with the Sri Lankan government to send peacekeeping troops to the island, and Indian forces ended up fighting the group RAW had armed. In 1991, Rajiv Gandhi, prime minister of India at the time of the peacekeeping force deployment, was assassinated by an LTTE suicide bomber. It was the support for the Tamil separatist group, Liberation Tigers of Tamil Eelam in Sri Lanka, that brought RAW much criticism from human rights organizations. Since its inception in 1968, RAW has had a close liaison relationship with KHAD, the Afghan intelligence agency, due to the intelligence it has provided RAW on Pakistan. This relationship was further strengthened in the early 1980s when the foundation was laid for a trilateral cooperation involving RAW, KHAD, and the Soviet KGB. Raman says RAW valued KHAD’s cooperation for monitoring the activities of Sikh militants in Pakistan’s tribal areas. Sikhs in the Indian state of Punjab were demanding an independent state of Khalistan. According to Raman, Pakistan’s ISI set up clandestine camps for training and arming Khalistani recruits in Pakistan’s Punjab Province and North West Frontier Province. During this time, the ISI received large sums from Saudi Arabia and the CIA for arming the Afghan mujahadeen against Soviet troops in Afghanistan. “The ISI diverted part of these funds and arms and ammunition to the Khalistani “terrorists,” alleges Raman. The CIA assisted in the creation of RAW, says South Asia expert Stephen P. Cohen of the Brookings Institution. However, India’s intelligence relations with the CIA started even before the existence of RAW, note experts. After India’s (4)war with China in 1962, CIA instructors trained Establishment (22), a “covert organization raised from among Tibetan refugees in India, to execute deep-penetration terror operations in China,” wrote Swami. But the CIA’s operations with the ISI to fight the Soviets in Afghanistan in the 1980s made RAW very wary. However, it did not stop RAW from seeking the CIA’s assistance in counterterrorism training. Raman writes: “One had one more bizarre example of how international intelligence cooperation works.” The CIA trained the officers of the ISI in the use of terrorism against an adversary, and at the same time, he writes, it trained RAW and IB officers “in some of the techniques of countering that terrorism.” India’s intelligence agencies also feel the lack of an equal relationship with the CIA, say experts. Swami says RAW’s grievance is that they get a little information on Pakistan from the United States; however, Washington expects New Delhi to provide it with intelligence on Afghanistan. In 1997, Prime Minister I.K. Gujral shut down both the CITs aimed at Pakistan on moral grounds. Before Gujral, Prime Minister P.V. Narasimha Rao had ended RAW’s eastern operations in the early 1990s, as part of his efforts to build bridges with China and Myanmar, say analysts. The intrusion of Pakistan-backed armed forces into the Indian state of Jammu and Kashmir in 1999 prompted questions about RAW’s efficacy. Some analysts saw the conflict as an intelligence failure. However, RAW officials argued they had provided the intelligence but political leadership had failed to act upon it. The Indian government formed a committee to look into the failure and recommend remedial measures. The report of the Kargil review committee was then examined by a group of ministers, established in 2000. The group recommended a formal written charter and pointed out a lack of coordination and communication within various intelligence agencies. Following the review, a new organization was set up: the National Technical Research Organization (NTRO)—modeled on the U.S. National Security Agency—which would be the repository of the nation’s technical intelligence-spy satellites, unmanned aerial vehicles (UAVs), and spy planes. The government also decided to create a Defense Intelligence Agency (DIA), whose head would be the adviser to the Chief of Staffs Committee and the defense minister. The DIA was empowered to conduct transborder operations. However, the shakeup of the intelligence apparatus has not removed some problems, especially relating to the overlap of agency activities, say experts. Earlier, RAW was the only organization permitted to conduct espionage operations abroad. Now, both the IB and DIA have the authority to conduct such operations, writes Singh. There have also been occasional media reports of penetration inside RAW by other agencies, in particular, the CIA. Swami writes that RAW is exceptional amongst major spy agencies in maintaining no permanent distinction between covert operatives who execute secret tasks, and personnel who must liaise with services such as the CIA or public bodies, such as analysts and area specialists. “As a result, personnel with sensitive operational information are exposed to potentially compromising contacts,” he writes. This Congressional Research Report outlines the history and objectives of the Indian government’s Research and Analysis Wing. CFR’s Pakistan Crisis Guide delves into the country’s regional security conflicts. Global Security provides a general history of the agency’s activities in this article. WASHINGTON: It was like a talk show on a Pakistani news channel when two top former officials of Pakistan had a heated exchange at a reputed US institution about the future of US-Pakistan ties and the Coalition Support Fund (CSF). Former Governor of State Bank Dr. Ishrat Hussain and former Pakistani ambassador to the United States Husain Haqqani were debating the utility of the Coalition Support Fund (CSF) and the US aid for Pakistan at the United States Institute of Peace (USIP) here on Wednesday. The audience included the former top US diplomats including assistant secretary of state for South Asian Robin L Raphel, experts of US foreign policy and some serving officials from both the countries. “CSF was not assistance. It was our money that we spent to support the US logistic operations in Afghanistan during the war on terror and it was reimbursed later. I sat in cabinet meetings where we approved allocation from our own budget to support the US operation. That money was later reimbursed by the US government through the CSF,” Dr. Ishrat said while responding to Haqqani’s point that Pakistan did not deliver enough after receiving the US assistance after 9/11. While praising the Indian progress after independence, Haqqani strongly criticized Pakistan for failing to utilize $43 billion aid it received from the US since 1949 for its development. Haqqani argued that the US should not provide large-scale assistance to Pakistan. However, the former ambassador of Pakistan was reminded by no one else but an American former official that the US assistance was given to Pakistan to protect US national interests. He said Pakistan did not need an aid model that never worked as it could not promote development. He said the US and Pakistan should cooperate in educational exchanges and human resource development as South Asian countries had huge potential. “US Fulbright program is helping Pakistani students but these students need to be sent to the top US universities to learn science, mathematics, and related subjects,” Ishrat said adding that currently the majority of Pakistani students were placed in less famous universities as it cost less. To this, Husain Haqqani argued that Pakistani students were not enough talented to get admission to the top Ivy League universities prompting a response from Ishrat. “This is not true I know many Pakistani students in my institute who are brilliant and could get admission anywhere,” Ishrat, who served as dean and director of the prestigious Institute of Business Administration (IBA) in Karachi, said. Speaking on the occasion,Robin Raphel said the US assistance to Pakistan did achieve objectives. “We always know money can’t buy you love but when you build a road, you build a hospital or school, people do like that,” she said. She listed major development projects that were completed in Pakistan with US assistance provided under the Kerry-Lugar bill. 4) the largest Fulbright program and university partnership apart from $1 billion humanitarian assistance. Praising Vision 2025 program of PML-N government, she said Pakistan under the current government had a better sense of development priorities. She said the current Pakistani administration was not talking much about aid but the focus had now shifted to trade and business opportunities. The MQM under Altaf Hussain reigned supreme in urban Sindh from 1988 till March 2013. It expanded its political power by introducing the cultures of dead bodies filled in sacks, extortion, kidnapping for ransom, torture cells, target killings, no-go areas and strikes to paralyze the city. Despite its policy of fascism, terrorism, blackmailing tactics and imperiousness, and turning the city of lights into darkness, it was cajoled and supported by the two mainstream parties and the establishment owing to the policy of reconciliation and political expediency. Ironically, it was also supported by intelligence agencies of India, Britain, and USA for the achievement of their vested interests. The ruling parties didn’t object to the illegal system adopted by Altaf to remote control his party with the help of International Secretariat after he fled to London in May 1992. He is in exile for the last 24 years, but he hasn’t visited Pakistan even once. He has maintained his communications with his followers on phone and video clips. No restrictions were imposed on his inflammatory speeches which he made for 20 years, or any eyebrows were raised when he delivered a highly objectionable speech in New Delhi in 2003. His anti-Pakistan speeches in March and July 2016 in which he ridiculed the Army and Rangers and sought the help of RAW, India, and the UN were also overlooked. His dreary speeches inciting violence were tolerated till as late as August 22, 2016. Even now the Federal and Sindh governments have taken a soft approach. Although operations were launched in Karachi in 1992 and 1995-6 to deal with criminal elements within the MQM, those were called off inconclusively and their sins pardoned. The MQM was politically strengthened by Gen Musharraf during his nine years rule, which enabled the party to strengthen its foundations at grass roots levels in urban centers of Sindh and gain control over 80% of the port city. The MQM leadership grieved of socio-politico-economic grievances whether in power or out of power as a policy, which it had adopted at the time of formation of APSMO in 1978 and had become the basis for its birth in 1984. It used coercive methods and blackmailing tactics to make the Sindh or Federal Government accept its legal and illegal demands. Consequent to its non-cooperative attitude, it always fell out with the senior coalition partner much before the expiry of the tenure. Its unrelenting malevolence forced all the political parties in opposition under the umbrella of All Pakistan Democratic Movement (APDM) to declare in 2007 that power will not be shared with the MQM in future. But the PPP under Zardari after coming to power in March 2008 made it a coalition partner, both at the Centre and in Sindh since both were beneficiaries of the infamous NRO. It is now no more a secret that the US and the UK were the architects of NRO to bring Benazir Bhutto to power. The NRO cleansed the top leadership of PPP involved in mega corruption and also 8000 activists and leaders of MQM involved in heinous crimes. The PPP and MQM are liberal parties but unnatural partners; yet they tolerated each other for next five years despite MQM soaking Karachi in blood by its high spate of target killings, extortion, kidnappings, land grabbing and other crimes. The reason behind tolerating each other was that both were heavily involved in financial terrorism and corruption and their patrons wanted the two to stay together to bleed Pakistan’s economy. The MQM’s woes began after the murder of Dr. Imran Farooq in London on September 16, 2010, which most people believed was the handiwork of Altaf and his henchmen. The reason was that Imran had developed differences with Altaf and was secretly forming his own party comprising of like-minded MQM leaders. Scotland Yard started pursuing the case, which scared the MQM leaders based in London. Another development which added to the woes of MQM was the raids of Metropolitan Police on Altaf’s house and MQM Secretariat offices in London on December 7, 2012, and seizure of 500,000 pounds sterling in cash along with handwritten lists of arm and explosives. The case of money laundering was initiated and it was determined that MQM was linked with India and was regularly receiving funds from RAW to destabilize Karachi. These confessions were made to the London Police by London-based MQM leaders Muhammad Anwar, Tariq Mir, and Sarfaraz Merchant, who was the middle man arranging funds through Dubai. Rigorous election campaigning of PTI in Karachi in 2013 upset Altaf so much that he incited his supporters in Karachi to resort to violence against PTI workers. PTI’s senior worker Dr. Zahra was gunned down by MQM target killers in May 2013. Later on, the killers and facilitators Kaleem, Rashid (alias Master), Zahid Abbas Zaidi and Irfan (alias Lamba) were arrested. Complaints were lodged with Metropolitan Police London by tens of thousands of Pakistanis living in Pakistan and in the UK to rein in Altaf. Although the MQM won 52 seats in urban Sindh and 24 seats in the Centre in May 2013 elections, but for the first time, both the PML-N and PPP refused to share power with it in the Federal and Sindh governments because of its fascist policies, intransigence and willful destabilization of Karachi. Yet another event which went against the MQM was Rangers operation which started in September 2013 to deal with all criminal elements and restore peace in troubled Karachi. Although it was even-handed and intelligence driven, within six months the MQM realized that the noose was tightening around its neck and it started raising objections that the operation was MQM focused. The reason was that majority of the arrested criminals belonged to the MQM. The arrest of two MQM criminals, Tahir and Junaid, by SSP Rao Anwar on April 30, 2015, uncovered the MQM-RAW connection. Junaid is the brother of Javed Langra, who was sector in-charge Lines Area Karachi in 1992 and had fled to India as a result of Army operation. Javed was made the chief handler of all MQM activists sent for training to India via Bangkok at a camp in Dera Dun. Rather than grilling MQM leaders, who shed tears of innocence, Rao was lambasted and sacked. Naeem (alias Fire brigade wala) gave full details of training in India to Bennet Jones. Arrested Saulat Mirza who was later sentenced to death on May 12, 2015, and over 600 hardened criminals of MQM laid bare the gory details of Rabita Committees in Karachi and in London, Tanzeemi Committee, Labor Division, sector/unit commanders, and Khidmat Khalq, how they would use the target killers, extortionists, and mafias to strike terror, foment ethnicity and sectarianism, amass wealth and gain monopoly over the port city. Raids on Nine Zero on March 11, 2015, and on July 16, 2015, exposed much more details about MQM’s criminal activities including the horrific Baldia Town factory incident in 2012. 250 workers were burnt to death by MQM goons because the factory owner showed his inability to pay Rs. 20 crore extortion money. Qaimkhani, Hammad Siddiqui, sector in-charge Rehman, alias Bhola, were involved in it. Those who had engineered May 12, 2007, massacre of political workers welcoming former chief justice Iftikhar in Karachi also came to light. The then Home Minister Waseem Akhtar, now Mayor Karachi, was named. The arrest of Kalbushan Yadav in March 2016 and his disclosure that he was operating RAW network in Baluchistan and Karachi and was linked with BLA and MQM reconfirmed MQM connection with RAW. 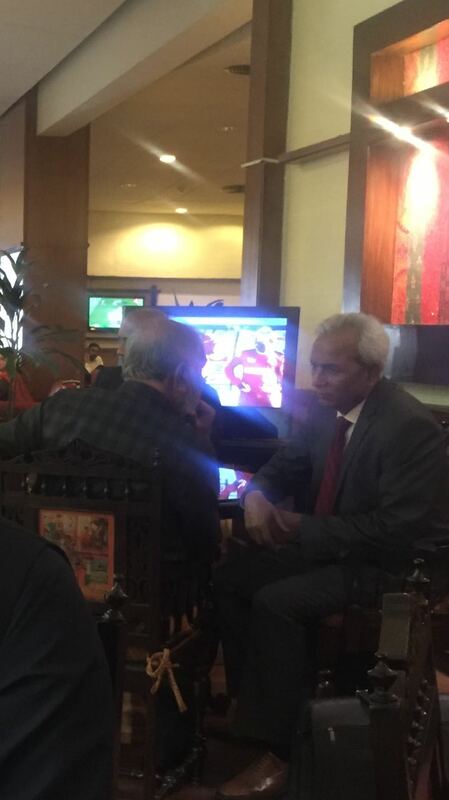 MQM-RAW connection was also exposed by BBC documentary, noted columnist Bennet Jones and Daily Ummat newspaper. Sealing of Nine Zero, break up of the militant structure by the Rangers and demolition of sector/unit offices, has weakened the authority and monopoly of MQM. This loss of power was witnessed when the businessmen refused to shut their shops on the call of MQM. Rangers and Army are eulogized for restoring peace in Karachi and the MQM reproached. Altaf’s health started to deteriorate on account of mounting tension and multiple diseases and he is now chair borne and desires to shift to the USA. These factors together with much publicized option of minus-Altaf formula impelled Dubai-based Mustafa Kamal (MK) (once a blue-eyed boy of Altaf and anointed as Mayor of Karachi during Gen Musharraf tenure) and strong-arm Anis Qaimkhani to rebel against Altaf and announce a new political party, Pakistan Sar-Zamin Party (PSP) with new flag and election symbol in March 2016. Several MPAs of MQM in Sindh Assembly joined MK. MK broke off ties with Altaf and London Secretariat and revealed details of Altaf’s psychopathic frame of mind, stating that he derived sadistic pleasure humiliating MQM leaders and in killing people particularly his opponents or those who defied him or those who became popular within MQM. He further added that Altaf assigned targets to the target killers in Karachi and South Africa directly. He also disclosed that M. Anwar (Indian national) in a meeting in Dubai in 2012 confessed of London Secretariat connection with RAW since 1989 and that the then Interior Minister Rahman Malik was present. MK tried to give an impression that he had the backing of establishment and enticed others to join him and get absolved of all criminal cases. Most of the notorious target killers and sector/unit commanders joined him, but after the arrest of Qaimkhani, they had second thoughts and some joined Farooq Sattar (FS) led the group. MK kept urging the ones in power to ban MQM because of its connection with RAW and anti-state activities. Successes achieved by the Rangers in reining in MQM terrorism flabbergasted Altaf and on several occasions, he lost his sense of balance while delivering his boring and incomprehensible speeches on phone. He crossed all limits on August 22, 2016, by chanting slogans against Pakistan and inciting his followers to attack TV stations and security forces. His loyalists instantly obeyed his instructions. This speech dug the last nail in his coffin. A strict ban was imposed on his speeches. This event gave birth to another faction of MQM under FS named as MQM (Pakistan). Currently, the MQM is divided into four factions; MQM (Pakistan) under FS which has been duly registered as a political party with ECP with election symbol ‘Kite’. Important leaders in his setup are Khwaja Izharul Hassan, Waseem Akhtar (Mayor) and Faisal Sabzwari along with the majority of MQM workers. PSP has been joined by Raza Haroon, Qaimkhani, Anis Advocate, Asif Husnain, Waseem Aftab and some second tier MQM leaders. The London group comprise of Nusrat Nadim, M. Anwar, Tariq Mir, Mustafa Azizabadi, Wasey Jalil. Its recently formed Rabita Committee in Karachi has been grounded after the arrest of its leaders Dr. Zafar Arif, Kanwar Khalid Yunus, Amjadullah, and Ishaq. MQM Haqiqi under Afaq Ahmed is also there but has almost become a non-entity and sooner than later it will join one of the two Karachi-based MQM factions. FS group’s Izharul Hassan tried to convince Gen Musharraf, currently based in Dubai, to help in reuniting the FS group and PSP and take over as the head of the united party. However, his proposal was politely rejected by Musharraf. He knew that 30-40% members of FS group are still loyal to Altaf, while 25% are fence sitters and are seeing how the wind blows. Musharraf was informed that his takeover will benefit MQM London and PSP since it will not be well received by the organizers and loyalists of Altaf in FS group and as such FS group will be a loser in next elections in 2018. Fearful of the unification scheme under Musharraf which will mark the end of Altaf politics, London group started poisoning the ears of the fence sitters in FS group that its leadership was planning to eliminate Altaf from politics and bring in an outsider. Their propaganda had an impact on the targeted audience. 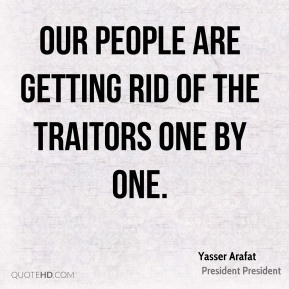 Gen Musharraf is himself in a weak position. He had proceeded to Dubai on medical grounds but under a deal that he will not return as long as PML-N is in power. He is otherwise implicated in several court cases including a case of high treason and his two properties have been confiscated on account of failing to present himself in the court. He, therefore, took a wise decision to stay out of MQM politics. People, in general, are viewing the different factions with skepticism; some saying all are chips of the same block and are employing tactics to buy time and reunite after the termination of Rangers operation, or change of military leadership. Factionalized MQM has certainly divided the Mohajir vote bank and faded the charisma of Altaf about whom it was stated till recent that there will be no MQM without him. He has remained unchallenged leader of MQM, but his success was owing to his policy of terrorization, media glorification, playing of the ethnic card, and above all patronage of MI-6, CIA, Mossad and RAW who behold him as a strategic asset. It was owing to their benefaction that he was set free in money laundering case which was an open and shut case. Likewise, Dr. Imran murder case has remained unsolved despite Pakistan giving access to the real murderers and facilitators (Mohsin Ali, Kashif Kamran, Muazam, Shameem). He is also not being charged for fueling violence in Karachi. The British government has given preference to Altaf over Pakistan. Crown Prosecution directed Scotland Yard that the money laundering case was closed and will not be further processed nor any action taken. This is unprecedented and speaks of mala fide intentions since a case is never permanently closed. A linkage of the handwritten list of arms is being drawn with the seizure of a huge arms cache from Nine Zero premises last month. Pressured by USA, Britain compromised the high reputation of its premier institutions to save Altaf and please India. Conviction of Altaf and five co-accused would have established RAW’s involvement in Pakistan. The MQM is in a quandary because of internal rift and power struggle between the three warring factions and none in Pakistan coming to its rescue. The Karachi-based factions under FS and MK are desperately vying to take the place of Altaf but none has his magnetism for the disadvantaged Urdu-speaking class, which is feeling orphaned without him. Like in the case of Donald Trump, they ignore all his negative aspects and want him to remain their lifelong leader since he had given them identity and strength to effectively deal with other ethnic communities and to control Karachi. The crisis has become grave with little hope of reconciliation and reunification. The possibility of reintegration of MQM London can be safely ruled out since Altaf has burnt his boats after his incendiary speech on August 22. Although he is terminally sick and can hardly move, his patrons who have invested a lot in him will keep extracting juice out of him till they find a suitable replacement. Sindh Assembly passed a resolution on September 20, 2016, which was moved by MQM (Pakistan) declaring Altaf a traitor and seeking his trial under Article VI. He is neither acceptable to the political parties in power and in opposition, or to the military, or the public, nor other two factions. However, the possibility of unification of FS and MK factions cannot be altogether ruled out, although there is again the problem of the clash of personality between the two leaders. MK group had a good chance to attract as many MQM leaders and activists up till August 22, but it couldn’t. Muhajir voters were still confident of Altaf’s resurgence. The emergence of FS group has become a handicap for MK group. Although, it is trying hard to woo as many prominent figures from FS group but so far his efforts have not borne fruit. MK blame former Governor Sindh Ishratul Ebad, who remained in this chair for 14 years, for stopping MQM leaders from joining him. The release of Qaimkhani and Mayor-elect Wasim Akhtar, both implicated in dozens of cases are setbacks for London group but are a morale booster for both MK and FS groups. The Later will gain more political benefits. The two rival factions intend to display their political power by holding rallies. While MK will hold a public meeting in Hyderabad on November 25, FS who has carried out intra-party elections and got himself elected as a convener will hold a meeting on December 25. MK is confident of winning Muhajir vote since he claims to have gained influence over the lower level organizational structure. Both are vying for the support of Establishment which has so far remained neutral. While the FS and MK led groups have so far not clashed with each other, the former is heading for a possible punch-up with MQM London which is exerting extreme pressure on it to rejoin Altaf or else resign from Assemblies since it had won seats on the tickets awarded by Altaf. 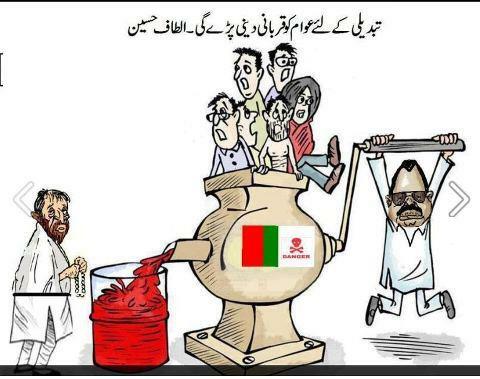 None in FS group has obliged and has taken firm steps to completely detach itself from Altaf group. Taking advantage of the divides in the MQM and their infighting and demoralization, other political parties have stepped up their efforts to capture as many Muhajir votes. The vacuum fillers in line are PPP, PTI, and JI. They are hoping for revision in delimitation in Karachi undertaken by MQM during Gen Musharraf rule to correct the anomalies. People of Karachi are more interested in peace and security than in fractious factions of MQM. They have more trust and confidence in the Rangers and the Army and want the Rangers not to terminate the operation till the achievement of conclusive results. Endnote: Why are MK and FS banking on MQM leaders and activists with criminal records and hands drenched in the blood of thousands of innocent people? Why can’t they start with a clean slate by inducting fresh blood from within the 2 crore Urdu speaking community? I am fearing another NRO-2 to cleanse the target killers, kidnappers, extortionists and Mafias under the policy of national reconciliation and hoping that the reincarnated MQM will refrain from militancy in future. Haven’t we suffered enough from the ill-effects of NRO-1?